Tom Blackburn, SC, kept repeating part of a text message that Geoffrey Rush sent to Eryn Jean Norvill, his young co-star in King Lear in June 2016, six months after King Lear finished a seven-week run in Sydney. With each denial from Rush that the text was nothing more than playful theatre banter, the Daily Telegraph‘s barrister went back to the words – and reminded the 67-year-old star of stage and screen that he had also attached an emoji that was winking and sticking out a tongue. It was the second day of Rush’s defamation claim against the Sydney tabloid over a newsagent poster and two articles which he says accused him of being a “pervert, a sexual predator and of inappropriate behaviour of a sexual nature”. 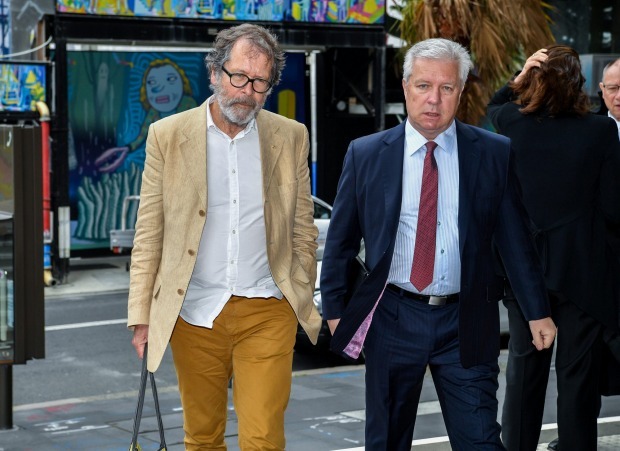 Australian director of theatre Neil Armfield (left) arrives at court. With each query, Rush would give Blackburn a confused look and tell him he was reading far too much into a “throwaway line”. The Daily Telegraph has taken the courageous – in the Sir Humphrey Appleby sense of the word – step of defending its articles as true. So the text is a crucial part of its preferred narrative of Rush as an ageing and sleazy thespian who touched up an actor on stage. King Leer, as it said in its headline. Rush’s legal team depict him as a victim of a bungled attempt by a gossip columnist to get a #MeToo scalp. That on the flimsiest of pretences, the newspaper ruined the spotless reputation of a man who had won “the triple crown” of acting; an Emmy (for TV), a Tony (for stage), and an Oscar (for film). Given Rush’s career, it’s not surprising the hearing has prompted headlines across the globe. The cast of King Lear by the Sydney Theatre Company. 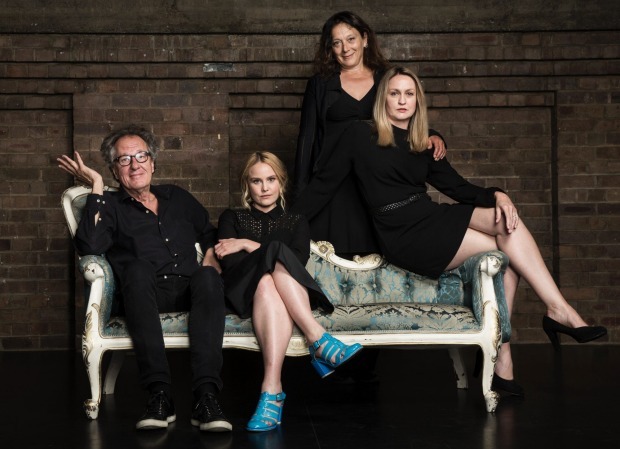 From left, Geoffrey Rush, Eryn Jean Norvill, Helen Buday and Helen Thomson. The script for this drama opened in a bar of the Sydney Theatre Company in April 2016. Norvill, who played Cordelia – the daughter of Rush’s titular character in the Shakespearean tragedy – was there with her agent and Annelies Crowe, the company manager of the STC. Norvill talked about Rush’s alleged behaviour, but didn’t want to make a formal complaint. The world now knows that Rush was alleged to have touched Norvill’s lower back under her shirt when they were backstage as he was preparing to carry Cordelia’s corpse on to the stage during a preview performance. He was also accused of tracing his hand down her torso and across the side of her breast during a scene in which King Lear carries and then grieves over her body. The newspaper says director Neil Armfield told Rush to be more “paternal” and felt that during the preview Rush’s actions had been “creepy and unclear”. It also claims during rehearsals Rush simulated groping Norvill’s breasts and made jokes about the actor’s body that contained sexual innuendo. It says Armfield told him to “stop it”. In court this week, Armfield denied saying any of this. He said it would have been difficult for Rush to lift Norvill’s body without a hand straying, but insisted he saw no “gratuitous action”. Ditto actor Helen Buday, who played another of King Lear’s daughters. Over his three days in the witness box, Rush seemed genuine in his protestation he had done nothing wrong. He also made some concessions that looked bad in news coverage, but which might help his case. These include agreeing he might have called Norvill “yummy” during rehearsals and that a thumb may have touched the lower part of Norvill’s chest during the preview. But to other questions, Rush, dressed in a regal purple suit, waffled and went on tangents with a haughty air that might have annoyed a jury. Wigney is hearing the case alone, which might be one reason Rush chose the Federal Court to make his claim. For the Daily Telegraph to prove its case, Norvill will need to be a convincing witness. No one has given her story – or the way the Telegraph told it – any real credence this week, despite Blackburn’s best efforts. She didn’t speak to the paper before the articles were published and only agreed to be a witness in July. The paper has no need to call journalist Jonathon Moran. It’s probably a good thing because McClintock is adept at picking apart the work of journalists and would have relished the chance to build on his theory that the newspaper was “looking for a [Harvey] Weinstein story” to counter a Fairfax investigation into TV star Don Burke. McClintock said Rush and Norvill had been victims of story. But when he cross-examines Norvill, his only concern will be for Rush. It could make the treatment of Rush this week look gentle.